My dream is to walk out of my house with nothing in my pockets (no keys, no ID, no credit cards) and to walk into the world a free and unencumbered person. And to have this be perfectly fine. I’m a long way from this becoming a reality. My car needs a key to start it, my house needs a key in order for me to get back in, and places of business want me to pay them using something tangible - like cash or a debit card. But I have made a lot of progress. To start with, I don’t carry a wallet. Instead, I use a rubber band or Ouchless hairband (these work great!) to wrap up a couple of cards in my back pocket. It’s so much slimmer than a wallet, and it encourages me to think hard about what I actually carry back there. Most days I carry two cards - my ID and my debit card. Today is unusual, and for some reason I happen to be carrying an insurance card and a My Panera card. How do I get away with so few cards? Prioritize - and cheat. Ninety percent of the time I’m away from the house, the only card I need is my debit card. My driver’s license, on the other hand, is pretty essential for legal reasons - even though I almost never need it. But the rest of my cards can be tossed. Kroger Plus card? I memorize the phone number it’s linked to. I can type it in at the register, and never scan a thing. Library card? I store the number in my phone - the librarians will happily forgo using the physical item. In fact, now that I’ve got an iPhone, I can store an unlimited number of barcodes, and pull them up as I need to. I use the myWallet app for this purpose. Even places that don’t provide you a handy member number usually allow you to access your membership info through some other means - like the driver’s license you’re already carrying. I do have a school ID badge, and a gym passkey. These things actually need to be present to be used, so they’re on a lanyard that I keep in my car. Since I only take my car to either of those places, I don’t need to carry them on me personally. So I carry two cards in my back pocket bound together with a hair-band. But what about keys? I’ve narrowed my keys down to 3 - one for my house, one each for my two cars. 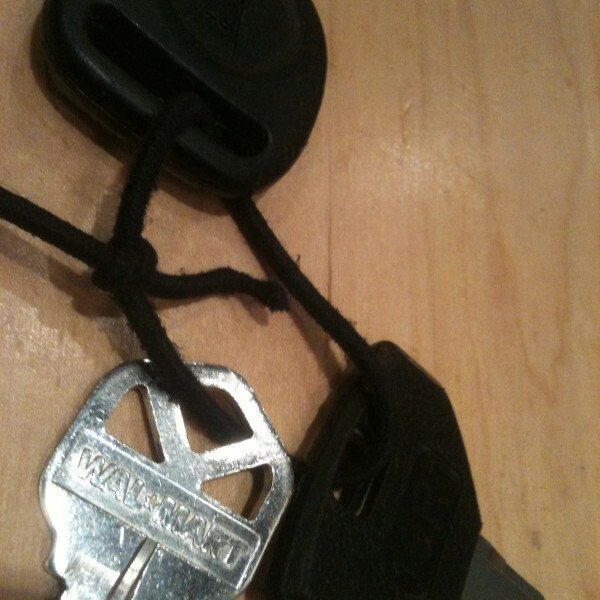 Until yesterday, I actually had two key-rings, each with just two keys: a house key and a car key. Since I only left the house with one specific car, I didn’t need to carry the other car key with me. Today, I’m carrying all 3 keys, because keeping up with two sets has gotten a little silly. But I refuse to use a regular key-ring. 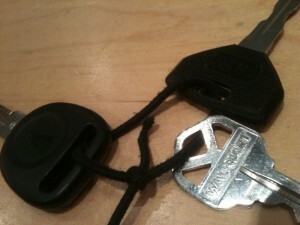 Metal key-rings are hard to use, and refuse to fold flat in your pocket. So I replaced mine with the afore-mentioned Ouchless hair-band. 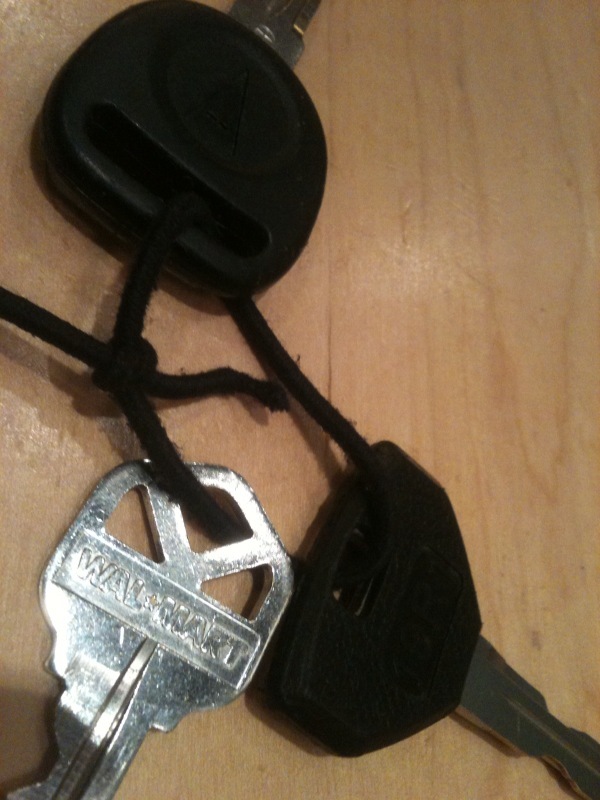 I simply ripped one apart at the glued seam, fed it through the keys, and then tied it back together. It folds completely flat, takes up no space, and is easy to handle. I still have one problem: the keys themselves are thicker than need be. In the past, I’ve gone to walmart, and gotten copies made without the rubberized grips. By slimming down to metal-only keys, I can get my pocket feeling almost empty. Since I’ve recently traded out cars, I’m back to carrying rubberized keys - for the time being. For what it’s worth, the keys go in the right pocket, since I’ll most likely be opening the driver-side door with my right hand. And in my left pocket…the iPhone. I thought I could never carry an iPhone because of its bulk. Before the iPhone, I had a slightly older Motorola Razr. I resisted upgrading, because Motorola actually started making their phones a little bigger after a while. But eventually, I had to get something new, and the new Razr was not that much smaller than an iPhone. And the iPhone’s sheer usefulness has justified its size. Because of the iPhone, I no longer carry a voice recorder (used for songwriting), or a camera (kept on my belt when I toured the Middle East), or a notepad. And I’m beginning to be able to avoid carrying a laptop. When I do carry my laptop, I carry it in a satchel that can hold the computer itself, the power cord, a notebook, headphones, and an iPhone syncing cable in a very compact space. But I increasingly want to go without it. And in order to do that, I have to have access to my files. Thankfully, the iPhone provides lots of options in that department. I personally use Dropbox to hold 2 gigabytes of my files for free, synced and backed up online. I can access it from my computer, from the web, or from my phone. (Do click on that link and join for free, because I get extra storage space if you do!) It’s the best tool I’ve ever encountered for protecting and freeing your files, and it just works. The rest of my data is backed up online with JungleDisk, which is more convoluted, but allows an unlimited amount of storage. It costs money, but also provides a way to access my data from anywhere. So I’m getting there. My pockets are very slim, but they’re not yet empty. When they can finally be empty, and everything still work just as well, then I will be in paradise. Reminds me of Cheaper by the Dozen and the dad who is an efficency expert. What is the fastest way to shower? Do you remember what he said about that? And which way to button your jacket or shirt is it up or down to save time? Interesting post! The next step along the way to walking out into the world as an unencumbered person is getting rid of clothes, if not entirely, at least to a great degree. Since summer began, I've started noticing how annoying clothes really are. But how to be selectively naked without offending anyone, that's the real issue.